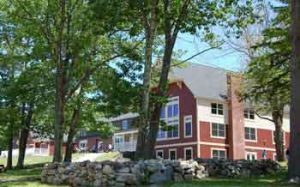 Shortridge Academy, a private co-ed therapeutic boarding school in Milton, New Hampshire, recently announced a unique enrichment program being offered to its students. As part of a community outreach effort, the school has partnered with Granite State Adaptive Sports, a non-profit organization that provides a variety of physical activities for people with disabilities. In the program, a select group of students from the school are given an opportunity to work with Granite State’s clients, coaching and guiding them in various sports. Granite State works with people from age three and up who have physical, cognitive or emotional disabilities as well as those who are visually or hearing impaired. The program offers sessions in adaptive skiing, therapeutic riding, and bike riding. Students from the school work with Granite State participants, guiding the horses, leading bike tours or teaching simple maneuvers on the snow. It is a chance, said Mik Oyler, chief operating officer at Shortridge, for the students to give back to the community and to expand their own self-confidence and interpersonal skills. The school works to provide a more open campus for their students as a step away from full treatment programs and towards a typical residential school. In the first winter session last year, the school administrators chose several students to help with the adaptive ski program. Administrators at the school found it gratifying to see their students open up to the Granite State clients. Over the summer, students joined Granite State for bike riding and equine therapy. At this point, the staff at Shortridge are looking forward to getting back out on the slopes again with a new group of students.